Skowhegan is excited to present a collection of alumni publications at The Skowhegan Book Meet. The Meet will be a unique opportunity to see the volume and breadth of printed works by participating alumni, whose years span 1956 to 2018, and will feature talks with artists Ali Fitzgerald (A '04) about publishing her first comic book, Josh Graupera (A '16) about his Philadelphia-based activist zine practice, and Pallavi Sen (A '17), Assistant Professor of Art at Williams College, moderated by Birgit Rathsmann (A '04), Skowhegan Alliance Member and this event's lead organizer. The event's primary focus is creating dialogue about art and book-making, and will feature some books in progress and unique works. Select publications will be available for sale, so people interested in buying work come prepared with access to PayPal or Venmo. Ali Fitzgerald (A '04) artist//artist//writer living in Berlin. She is a regular contributor to the New Yorker and recently began a monthly satirical comic there about America. She has also contributed comics to the New York Times, New York Magazine's The Cut, Modern Painters Magazine, Art-Das Kunst Magazin and Greenpeace Magazine. She wrote and drew the popular webcomic "Hungover Bear and Friends" for McSweeney's from 2013 to 2016. Her first book titled, "Drawn to Berlin," about teaching comics in refugee shelters and Berlin's evolving relationship to Bohemia and immigration will be published on October 23rd 2018 by Fantagraphics. Josh Graupera (A '16) is a Philadelphia-based artist and activist. Born in Lancaster, PA, he graduated from Millersville University with a BFA in Painting in 2014. He has participated in residencies and fellowships at Media Mobilizing Project, Second State Press, 40th Street Artist in Residence Program, the African American Museum of Philadelphia’s Art and Social Change Residency as well as the Fabric Workshop and Museum’s Apprentice Training Program. He is an Arts and Media organizer with Stadium Stompers, a worker-owner of Bonfire Media, and a community liaison for Lancaster City’s PACE Program (Public Art Community Engagement). He has worked as an educator and facilitator with Al-Bustan Seeds of Culture, ArtWell, Fleisher Art Memorial, the Free Library of Philadelphia, the Fabric Workshop and Museum and Swarthmore College. Pallavi Sen (A '17) is from Bombay, India. She works with installation, printmaking, textiles, Instagram, and intuitive movement. Current interests include inner lives of birds and animals, the grief of imagining a future in the anthropocene, South Asian costumes, domestic architecture, altars, deities, the desire for an atheist to believe, skate/bro culture, style, pattern history, toxic masculinity, friendship + love, her future lover, farming and the artist as farmer, work spaces, work tables, eco-feminism, love poems, the gates to Indian homes, walking, and cooking deliberately. She received her MFA in Sculpture + Extended Media from the Virginia Commonwealth University and is an Assistant Professor of Art at Williams College. Printed materials are a site for exploration distinct from any other kind of art object. 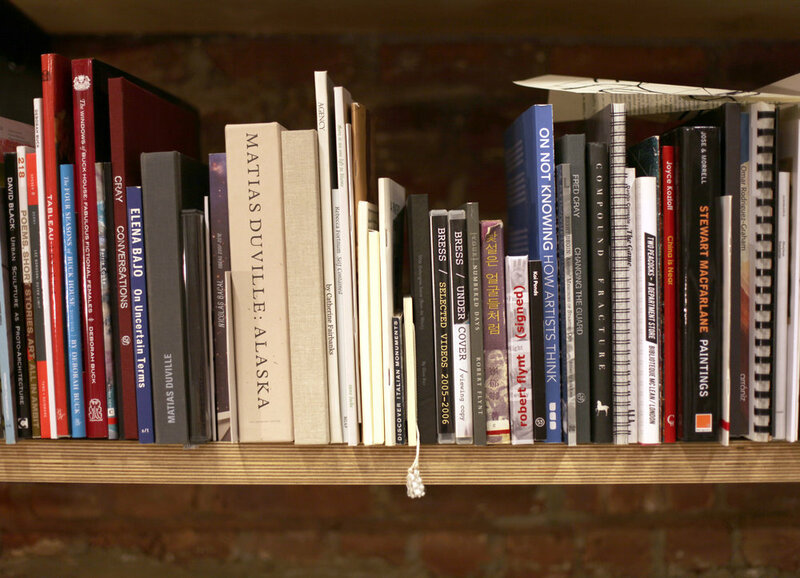 Art books are objects which can move between gallery, library, research, and your bedside table. Books make projects immediately accessible, even if they happened far away, long ago, or for only one day at a now defunct space. Zines are the DIY version of published art books. Economical and immediate, zines let artists focus on building community or have a singular exuberant outburst. They are intimate, printed and stapled at home.